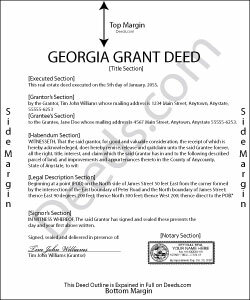 A grant deed is a real estate deed that is used to transfer real property in Georgia from one entity to another. There are no statutory forms provided for a grant deed in Georgia. If a deed sufficiently makes known the transaction between the parties, no want of form will invalidate it ( 44-5-33). In a grant deed, the grantor warrants and forever defends the right and title to the described property unto the grantee and the grantee's heirs and assigns against the claims of all persons owning, holding, and claiming by, through, or under the grantor. When submitting a grant deed for recordation, it must be an original, signed by the grantor, and should be attested or acknowledged as required by law ( 44-2-14). Grant deeds executed in Georgia may be attested by a judge of a court of record, including a judge of a municipal court, or by a magistrate, a notary public, or a clerk or deputy clerk of a superior court or of a city court created by a special act of the General Assembly. With the exception of notaries public and judges of courts of record, such officers may only attest instruments only in the county in which they respectively hold their offices ( 44-2-15). In order to record a grant deed that has been executed out of state, the deed must be attested or acknowledged before one of the officers listed in 44-2-21 and must be attested before two witnesses, one of whom may be the official taking acknowledgments ( 44-2-21). Grant deeds executed in Georgia also require two witnesses. A grant deed must also be accompanied by a completed real estate transfer tax form. A grant deed should be recorded in the office of the clerk of the superior court in the county where the property is located. The recording act in Georgia is a race-notice act. A grant deed can be recorded at any time, but a prior unrecorded deed will lose its priority over a subsequent recorded deed from the same vendor when the purchaser takes such deed without notice of the existence of the prior deed ( 44-2-1). Deeds, mortgages, and liens of all kinds that are required by law to be recorded in the office of the clerk of the superior court and which are against the interests of third parties who have acquired a transfer or lien binding the same property and who are acting in good faith and without notice will take effect only from the time they are filed for record in the clerk's office ( 44-2-2b).